June 5 will be the last of two recent opportunities (the last was 2004) to see the disc of Venus pass across the face of the Sun as seen from Earth. Before this month’s passage and the 2004 event, we last saw such a transit in 1884. 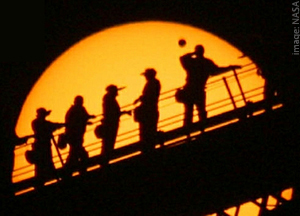 The next transit of Venus after Tuesdays? It’ll be 2117…105 years from now. In case you’d like to sit back and have a guided tour of the transit, Royal Astronomical Society of Canada centres across Canada are hosting viewing sessions in major cities: Here’re the details. So how to see this once-in-a-lifetime event…In addition to timing and safety (which we’ll cover in spades below) if you’re really intent on seeing this transit, you should also be aware of local and surrounding weather in the days and hours before. If the weather where you are isn’t relatively clear, you will also have to be willing to drive potentially long distances at the drop of a hat. When getting ready to observe this event, treat it like it’s a non-refundable airline trip. If possible, arrive at your viewing location AT LEAST an hour before the transit begins in your neck of the woods – longer if you have complicated telescope and/or camera gear to set-up. If it’s not going to be mostly clear where you plan to view according to the weather forecast a few days-out, it’s time to start looking at alternative viewing locations. If this happens, get ready to head to your #3 location. If the forecast for #3 is grim, plan to head to location #4, and so-on. This can be done through a camera zoom lens with a glass or Mylar solar filter or #14 welder’s glass in front of it, or through a telescope with camera adapter and T-ring for an SLR camera and one of the above filters. Got any images of the transit – especially with people in the shot? Share them below or on our Facebook page – We’d love to see them! Meanwhile, happy (safely-protected) Venus transit-gazing! Previous Previous post: Best eclipse for 12 years in North America!